Ban glyphosate-based herbicides, exposure to which has been linked to cancer in humans, and has led to ecosystems degradation; ensure that the scientific evaluation of pesticides for EU regulatory approval is based only on published studies, which are commissioned by competent public authorities instead of the pesticide industry; set EU-wide mandatory reduction targets for pesticide use, with a view to achieving a pesticide-free future. Did you know a poisonous, potentially cancer-inducing chemical could be present in your body? [1, 2] This is possible because our food is being sprayed with it. In fact, scientists have found traces of the hazardous chemical Glyphosate in the urine of nearly 1 in 2 people tested. 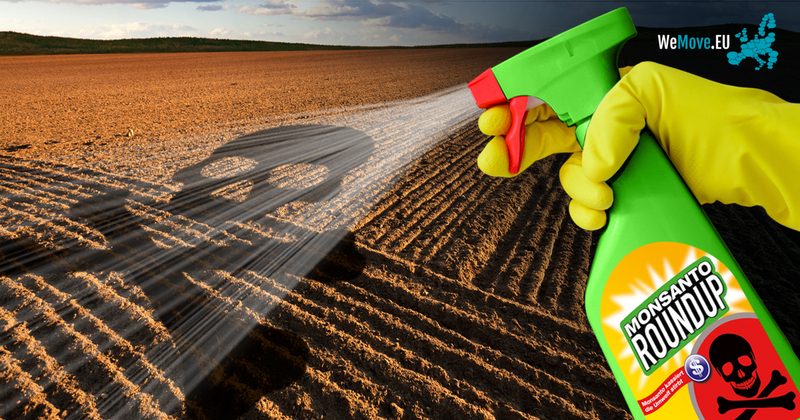 Glyphosate is a common pesticide, used on everything from food to gardens. The World Health Organisation has labelled it as “probably carcinogenic”. It is also very harmful to plant and animal life. In short, it’s a pretty damaging pesticide. In Summer 2016, after a long campaign by hundreds of thousands of Europeans, the European Commission was unable to relicense the use of Glyphosate for 15 years, but instead had to settle for a short 18 month renewal. This was a huge success achieved in the face of intense lobbying by the chemicals industry. But big producers of weed killers like Monsanto are still lobbying to protect their profits. Their deep pockets have been paying for “studies” and “expert” opinions to show that their product is safe. On July 3 we officially submitted 1,320,517 signatures to the authorities as our European Citizens’ Initiative. Now, the European Commission has issued its formal response to the #StopGlyphosate European Citizens Initiative (ECI). It officially recognised the submission of more than one million signatures on 6 October. The Commission responded to the ECI by saying it had no scientific or legal grounds for a ban of glyphosate and that national European governments had voted in favour of a five-year licence. Like this, the Commission ignores the fact that whole pages in the report on glyphosate by the German Federal institute of risk assessment, on which the reasoning of the Commission is based, were evidently copied from Monsanto's application portfolio. This is not independent and scientific working. Read the entire report of the research conducted by an expert on plagiarism. In addition, the Commission should have taken into account the classification of the UN cancer research agency, the existing scientific evidence on the unacceptable environmental risks posed by glyphosate and significant public concern. The Commission’s proposal to increase data transparency is a partial and misleading response to the ECI’s demand that EU pesticide approvals be based only on fully published studies. Existing EU law already provides for the release of the studies, as confirmed by the European Court of Justice. EFSA has withheld data contrary to this ruling. A number of members of the European Parliament have therefore brought a case against it. Monsanto and Cheminova are supporting EFSA in this case. We still collect signatures, which help grow the pressure on the decision makers. The Commission must take action against governments that fail to implement the sustainable use directive. Take action now: sign our petition against Monsanto’s cancer-inducing poison. The German Federal Institute for Risk Assessment (BfR) found only four tumour incidences in the revealed studies, whereas an independent scientist reviewing the raw data found 21 tumor incidences. All details to be found in the open letter send by Christopher Portier to Jean Claude Juncker, President of the European Commission from May 28, 2017. Our community organised the European Citizens’ Initiative together with: Campact, Corporate Europe Observatory, CEO, Global 2000 Greenpeace, Health and Environment Alliance, HEAL,, Pesticide Action Network, PAN Europe, Skiftet , Danmarks Naturfredningsforening and more than 90 other European organisations. I want my children to be able to eat food that is safe. Without small regular donations from the WeMove community, we would not be able to run most of our campaigns. But if even more people started donating a few euros each week we would be able to run bigger and more stronger campaigns, just like this one. And we wouldn't need to worry about backing down from a fight for lack of resources. Join thousands of others who enable the WeMove community to run big and impactful campaigns like this one. Donate now. The European Food Safety Authority (EFSA) overlooked key findings that a popular weedkiller causes tumours, which were easily discovered by an independent scientist reviewing the raw, industry-funded data! His findings indicate that EFSA is blindly following evidence provided by the pesticides industry. Together we can stop Glyphosate -- Join us! Thank you for adding your voice to thousands of other Europeans demanding the European Commission bans the toxic chemical Glyphosate. If this is your first action with us, you will receive a thank you email asking you to confirm your email address. You need to click 'confirm' for us to be sure it is you who signed this action. For our European Citizen’s Initiative on Glyphosate to be successful, we have to reach over 1 million valid signatures. In addition to that, we need to reach a minimum number of signatures in at least seven member states. We need everyone to ask their friends and family to also sign. Can you help us reach the goal by forwarding this email to your friends and family? Why are you asking for so much personal information? For this reason there are also certain rules that must be followed when signing. The information fields required are not set by WeMove.EU, but are determined by which member state you are signing the ECI for. The extra information that is being asked of you is a legal requirement for your signature to be considered valid. What exactly am I signing when adding my name to this European Citizens' Initiative? Your information is firstly encrypted (so no one can access it) and is stored temporarily on a secure server in Germany. Once enough signatures have been collected in your country, they are then handed over to the officials in your country who will offically verify the signatures. WeMove is legally not allowed to store or use the extra information you supply for any purpose other than relating to the European Citizen’s Initiative you have supplied it for. Once the ECI has ended, WeMove will destroy all the extra information supplied for the purposes of this ECI. WeMove's ability to perform these tasks securely has been certified according to the requierements of the European Union. All normal data protection rules and law apply. A European Citizens' Initiative is a special way that ordinary European citizens like us can demand the European Commission investigates whether there should be a change in the law in Europe. It is different to a regular petition because this tool legally obliges the European Commission to consider and investigae our demands as citizens. So it gives us more bargaining power. To be considered successful, a European Citizen’s Initiative needs to reach over 1 million valid signatures throughout the European Union. In addition to that, a minimum number of signatures must be reached in at least seven member states. ECI’s can only be on a topic or policy that the European Commission has the power to legislate on. To see more information on exactly who is eligible please visit the website of the ECI from the European Commission. It seems to be common-sense that cancer-inducing poison should not be sprayed on our farms, our countryside and our neighbourhoods. We now have the chance to make our voices heard through a European Citizens Initiative -- a legal route that means the European Commission has to listen to us if we collect one million signatures this year. We know what a constant use of Glyphosate will mean for us, the people of Europe: sick people, dead animals, burnt grass, brown leaves, and a loss of biodiversity. Last year, we were able to block Monsanto’s plans in ways they did not expect. But it’s not over, and in 2017 they will be fighting hard to extend the currently short term approval of glyphosate to 15 years. Which is why we will be fighting even harder to stop them. Take action now: sign our Citizens Initiative against Monsanto’s cancer-inducing poison. This chemical is called Glyphosate and is one of the most widely used active substances in pesticides worldwide. Thank you for adding your signature to this European Citizens' Initiative against Glyphosate, and standing for health, environemnt and democracy with us. Together, we're showing Monsanto and the pesticides lobby, what people power really means. Thanks for being a part of this movement!